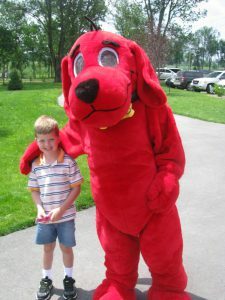 While Kate’s life was very short in terms of years, her struggle and impact has positively touched the lives of thousands of hospitalized children in Northeast Indiana and continues to do so through Kate’s Kart, a non-profit started by her family aimed at providing free books to children while they fight their illness while hospitalized. 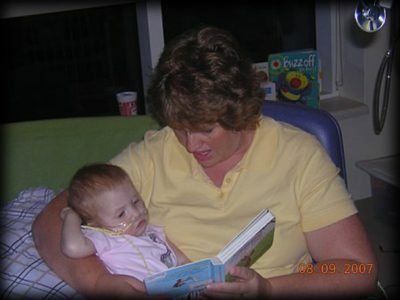 Looking at books was something Kate enjoyed, and something that continue’s to honor her memory while helping hospitalized children forget about their own struggles in a good book, even if it’s just an afternoon. This is our story. 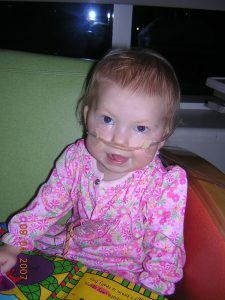 Learn about Kate’s fight, and the eventual creation of Kate’s Kart that has help so many children. Katherine Anne enters the world at 7lbs 10oz....all is good...Apgar scores are 9. All the family meets Kate. Doctor gives good report. Kate has hip dysphasia, but it can be fixed with a soft cast. Nurse comes in to tell us that Kate's color is bad, her oxygen levels are low and they can't get them up. 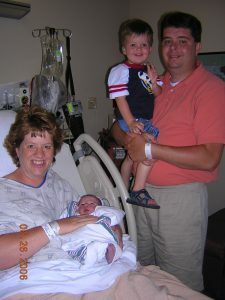 Kate is sent to Neonatal Intensive Care Unit (NICU) and gets an echocardiogram. They discover a serious heart defect, start her on medicine and intubate her. We learn that she is missing her pulmonary artery. There are 3 tiny collateral arteries that God miraculously gave her, but those don't supply enough blood. Surgery is imminent. Kate is rushed by ambulance to St. Vincent Hospital in Indianapolis. 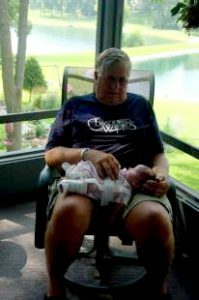 After getting discharged in less than 24 hours after delivery, we drive the 2 hours south to Indy. We meet with a cardiologist in Indy...he explains her situation and tells us he needs to do a heart catheterization in order to determine the next steps. Her official diagnosis: Tetralogy of Fallot with Pulmonary Atresia. The cardiologist is optimistic and tells us after a couple surgeries, she will lead a normal life. We find out that Kate's heart condition is due to a genetic disorder. Kate has a deletion in her 22nd chromosome. 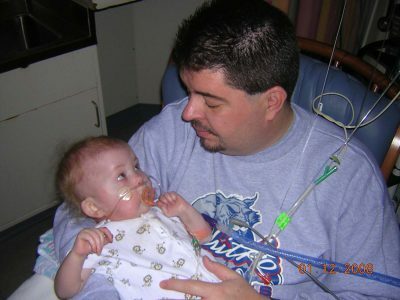 The disorder goes by several names: DiGeorge, VCFS or just 22q. We are devastated. Kate has her 1st heart surgery in Indy at the age of 3 months. All goes well with the surgery and the surgeon was able to unifocalize her 3 collateral arteries and bring them together into a shunt. 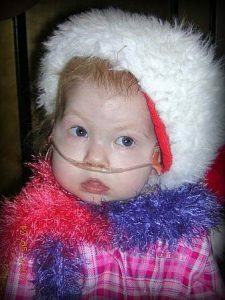 Kate spends 3 weeks in the Intensive Care Unit at St. Vincent's. She developed a lung infection and has a hard time coming off the respirator...she failed after the 1st attempt a week after her surgery. They do a CT scan to check for stroke...no stroke but they find her brain is "abnormal." More devastation. 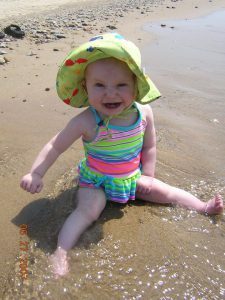 The MRI shows that she has Polymicrogyria and the right side of her brain is not as developed as her left. Kate begins to blossom! Feedings get much easier. She is consistently gaining weight. She begins to sleep for more than 3 hours at a time. Therapy sessions are working and she learns to roll, sit and utilize both hands. The weather gets better, flu season is over and we can go outside! YEAH! 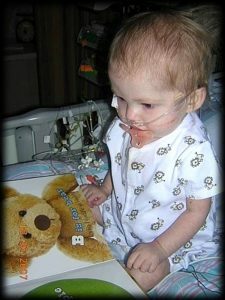 Kate has her 2nd open heart surgery at the age of 13 months...her "final" repair. The surgeon puts in an RV to PA conduit and closes the VSD. Two days later they discover that there is a residual VSD. They do an emergency heart catheterization and the cardiologist and surgeon agree that she should be able to come off the vent and it shouldn't cause a problem. Kate has her 3rd open heart surgery in attempt to close her residual VSD. Kate is throwing up a ton the 3 days we have been home and is not eating anything. We take her to our local hospital where they decide to fly her by helicopter back to Indianapolis. The minute the nurse takes her off my lap in Indy...she arrests. She is without a heartbeat for 20 minutes while the doctors attempt to get a central line placed. The line finally gets placed...and Kate responds to the epinephrine and her heart begins pumping again. She spends another 25 days hospitalized as they continue to adjust her meds. We go to University of Michigan at Ann Arbor for a consult, echo and heart catheterization. The team there is optimistic about condition...but definitely feel that surgery is necessary to repair the VSD, repair her leaking tricuspid valve and replace her leaking conduit. Plus...the docs highly recommend she gets a g-tube to both get her calories and strength prior to surgery and allow for a quicker recovery. Surgery gets set for November 27. We leave U. of M. after 3 nights encouraged and optimistic about Kate's heart. We're back in Indy for her g-tube placement. In addition, the surgeon does the Nissan Procedure to help control her reflux. During surgery, the surgeon found and repaired a hiatal hernia and dilated her constricted esophagus. Finally...the day is here and Kate goes back for surgery to repair the VSD, repair the tricuspid valve and replace the conduit. The surgery takes 5-6 hours and the surgeon, Dr. Bove is optimistic afterwards. He is aware of a small VSD he could not assess...but everything else looks great. We see her and we think she looks great! Kate goes to the heart catheterization lab...and they determine that nothing else can be done...and the pressures still remain high. There is a chance she might improve...but her pulmonary arteries are just too small to manage all the blood flow from the heart. Their goal...get her off the breathing tube. After countless talks with many cardiac docs we are assured that there is nothing more medically that can be done for Kate's heart. After many more talks with family, our pastor, each other and God...we decide to not pursue any further interventions. We place her in God's hands...and do all that we (and the medical team) can to keep her comfortable. Kate drinks a bottle of milk, rolls over and peacefully passes in her mother’s arms. No more tubes, no more pokes...no more tests....no more shots...no more medicine...no more pain! Kate is laid to rest in Portland, Indiana. Her body buried...her spirit living forever in eternity with her Heavenly Father. “Kate blessed our lives for 568 wonderful days. 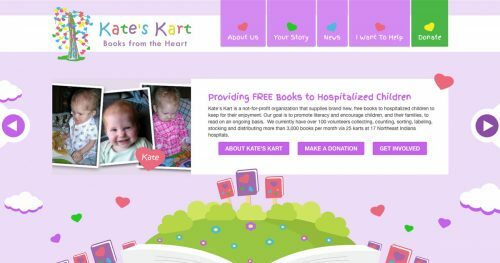 Kate’s family decides to utilize their memorial money and start a rolling book kart at a local hospital. This was due to Kate’s love of books. 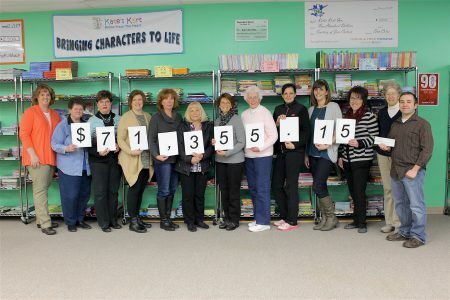 With the help of family and friends, a name was given, a logo designed and plans were underway to collect books. At the age of 3, Kate’s older brother helps to design the logo, using a computer to place the hearts on the tree. 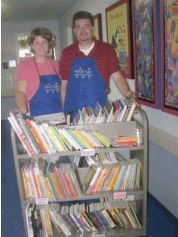 The first official event was held in conjunction with Magic 95.1 “Little Give” Contestants Jenny Teders and Shannon McClure took on the challenge with the hopes of filling a U-haul full of new children’s books for the Layman family to put on their book cart. The event was a huge success, and the “Fill The U-Haul” book drive took in over 5,500 brand new books, plus over $3,000 in monetary donations, totaling over $31,000! Kate’s Kart was off and rolling! 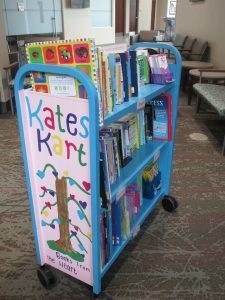 The first Kate’s Kart rolled through the halls of Lutheran Hospital in Fort Wayne, Indiana, on June 4, 2008. Kate’s Kart hosts it’s 1st annual Ice Cream Social. With the help of sponsors, ice cream, games, and entertainment are provided for free to the community. 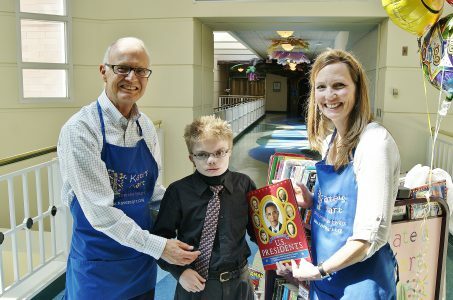 10,000th book was handed out to an oncology patient at Lutheran Hospital. 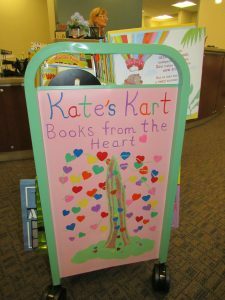 Kate’s Kart has grown to service 16 Northeast Indiana hospitals. Due to our tremendous growth over the last 5 years, we have outgrown our book storage sheds and moved into an office/storage facility with over 3 times the amount of space. Once again outgrowing our space, the Kate’s Kart office/storage facility is moved into another new space. 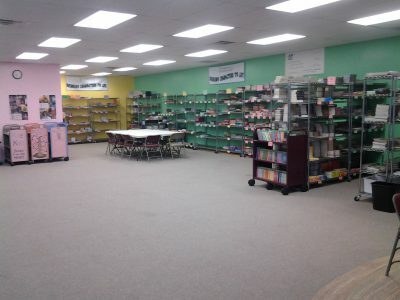 This colorful new space is 3 times the size of our last space and offers a store front space in Leo Crossing. 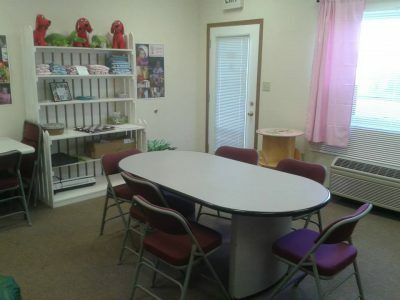 The space allows for meetings, field trips and lots of storage. 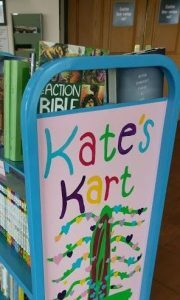 Kate’s Kart hands out it’s 100,000th book. Dylan, a frequent patient is the lucky recipient of this very special and ceremonial book. 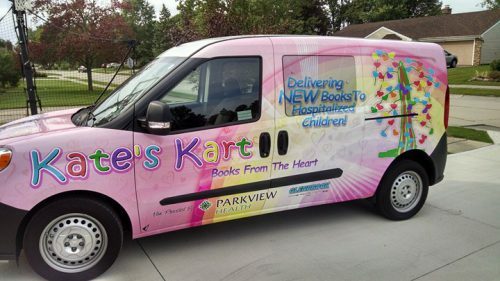 Through a generous donation from Parkview Health and Glenbrook Dodge, Kate’s Kart gets a brand new cargo van. It is wrapped with our signature color, pink and includes our logo. This is a tremendous blessing as many miles are driven delivering books to all the hospitals. Kate’s Kart is chosen as one of the recipients of the WOWO Penny Pitch. Through a community radio-a-thon, Kate’s Kart is awarded almost $72,000 to aid in the addition of new karts. The overwhelming growth, along with the need for the Director to be in the community sharing our story results in the need to add additional staff. An administrative Assistant is hired. 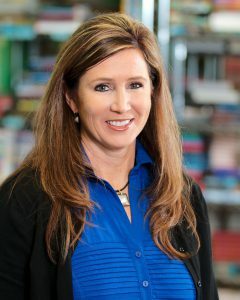 Welcome Cheryl! Kates’s Kart works with local digital marketing company, LYFT Digital to launch a new interactive website and create a promotional video. 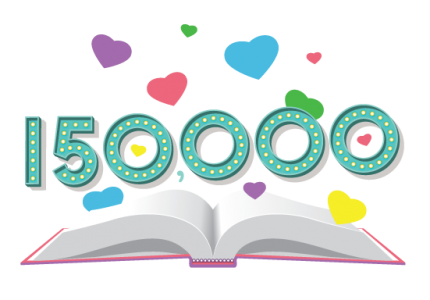 With the help of hospital staff and Kate's Kart volunteers, the 150,000th book was given to a hospitalized child. Karts added to IU Health Blackford and Parkview Regional Medical Center Clinic bringing our total to 27 karts in 18 hospitals! Kate's Kart begins our 10th year! 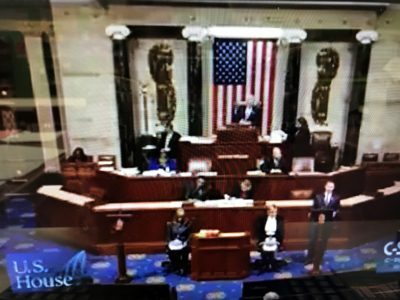 Congressman Jim Banks honors Kate's Kart and the Layman family on the House Floor in Washington DC. A new Kart was added to the Parkview Behavioral Health Pediatric and Adolescent Unit bringing our total to 28 Karts! Another new hospital and Kart were added this month at Parkview Wabash Hospital. This brings our total to 29 Karts and 20 hospitals!